Holly Knitlightly: The List: May Update! This month it's a little bit late... but time for my monthly update on "The List"! Okay, so I kind of got out of making the SPCA blankets. I mean, I made a lot... almost 100. Anyway, so I kind of got bored of the same square over & over & over. (Plus in April I made 28... so that was a lot.) So now I'm making baby hats to donate to the hospital. I like to switch it up a bit. Anyway, I only made a few baby hats in May, so I'll just add that total to my total for June at the end of this month. Book-wise, I re-read A Million Little Pieces (can you tell it's been dropped in water? Haha look how expanded my copy is... I think I dropped it in the bathtub a few years ago.) 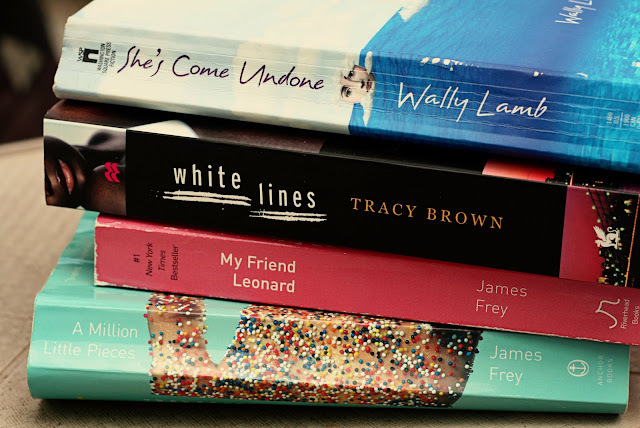 and My Friend Leonard by James Frey, read White Lines by Tracy Brown, and I re-read She's Come Undone by Wally Lamb for the third or so time. My goals for May were to make 20 blankets. Well, I made 0. Ha. Read 4 books - I did! Write 5 letters. I'm going to say I wrote 4? So I almost reached my goal... In June I'm hoping to make at least 30 baby hats, read 4 books and write 10 letters. I really need to start writing more letters if I want to write 100 by the time the year is over! Great idea! I should make goals too! It's already the middle of June and I haven't finished reading one book! I have a new giveaway on my blog if you're interested! Hi! saying hello from Elycia's! Love book posts! She's Come Undone is the only one I've read out of that list. How were the others? She's Come Undone has been on my bookshelf for a very long time. I might need to break into it! I'm always intrigued by books that others can read more than once. Oh my! I just bought She's Come Undone for 10 cents, on Saturday and I'm on chapter 15 today. I can't put it down. I totally stumbled across your blog, I think we may live really close to each other... Yay for local bloggers!